New Bylaw for Heysham Nursery area? There is already an exclusion zone around the nursery area for boats fishing for Bass, in addition to which we are now working on a new bye-law, though as yet not implemented, excluding ALL fishing including that done from the shore too. Thankfully an odd person saw fit to pass the word around and his post soon made it onto a couple of forums. Panic was not the word, thinking that the current area included the Northwall at Heysham Harbour – thankfully this has turned out not to be the case. However the area will include some of the south harbour wall, the south roundhead, the Wooden extension and of course the area actually around the power station outflows. We have been in contact with the Inshore Fisheries and Conservation Authorities (IFCAs) and have received further information on the matter along with an accurate map of the area. The wording of the new by-law is as follows. No person shall fish for or remove any sea fish by any means from that part of the District surrounding Heysham Power Station, which is covered by the Bass (Specified Areas) (Prohibition of Fishing) Order 1990, SI 1990 No. 1156 during any part of the year, unless for scientific purposes with the written permission of the Authority. 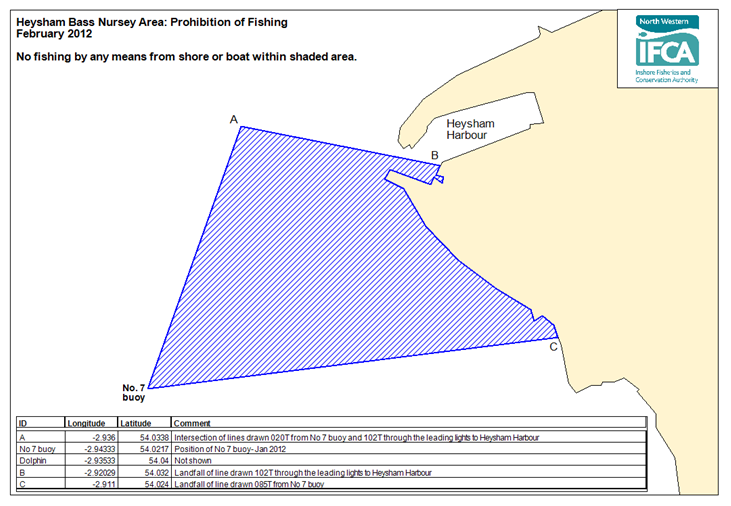 In short – A ban on ALL fishing activity in the Nursery area has been proposed. Along with the map i was also sent some further information. These are available as attachments on the forum, alternatively please CONTACT US if you would like copies. Do you fish in Morecambe?